If you click-and-hold on a program’s Dock icon in Mac OS X 10.6, after a couple seconds you’ll see Exposé-like window previews that make it easy to choose the desired window. A similar feature of Windows 7 that many switchers—and even quite a few Mac users—prefer is Aero Peek, which, when you move the cursor over an program’s icon in the taskbar, instantly shows you a thumbnail of each window in that program. DockView offers an Aero Peek-like alternative for Mac OS X, but one that offers more features than Windows or the Dock. Simply move your mouse cursor over a program’s Dock icon, and instantly you’ll see live-updated previews of that application’s windows. (A useful setting lets you opt to see previews only when pressing a modifier key.) To switch to a particular window, simply click its preview or—great for the keyboard-centric—press the keyboard shortcut (Command+1, Command+2, and so on) displayed on the preview. To close a window without having to switch to it, simply click the close (x) button that appears when you move the cursor over the window’s preview. Some window previews provide additional options. For example, the preview for an iTunes window includes Back, Play/Pause, and Forward buttons; the preview of a QuickTime Player or VLC window includes a Play/Pause button; and the preview for a Mail window includes a Get Mail button. 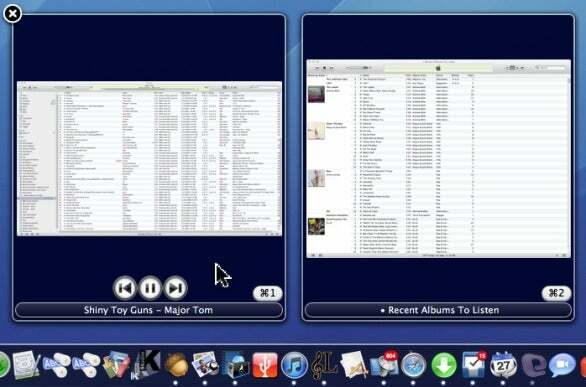 You can also opt to view DockView’s previews from within Mac OS X’s Command+Tab application switcher. With this option enabled, moving the mouse cursor over any program’s icon in the application switcher shows the same live-updated previews and the same keyboard shortcuts for switching directly to a window. DockView offers plenty of options for customization. For example, you can adjust the delay before previews appear, and you can choose the size of DockView’s window previews—and if you find those previews to still be too small, you can enable a feature that displays a full-size (static) preview when you mouse over the standard preview. You can also choose whether or not DockView displays previews of minimized windows, hidden windows, or applications that currently have only a single window open. And if an application doesn’t get along well with DockView—a few programs don’t—you can disable DockView for that particular program. Finally, DockView lets you configure a number of keyboard shortcuts for enabling and disabling its previews. What if you’re using programs that don’t appear in the Dock? If you configure DockView to display its own icon in the Dock, a beta feature can display previews of those programs’ windows whenever you move the cursor over DockView’s Dock icon. In addition to the minor issues I already mentioned, sometimes DockView’s window previews can be distracting, which is a good reason to configure DockView to show previews only when, say, you’re holding down the Command key. But if you like Aero Peek, give DockView a try.